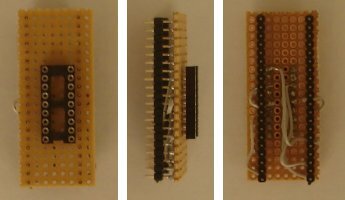 The IIC MIDI module provides a bridge between IIC and MIDI, and mainly consists of a PIC16F88 microcontroller from Microchip, which runs with a special firmware (not MIOS!). 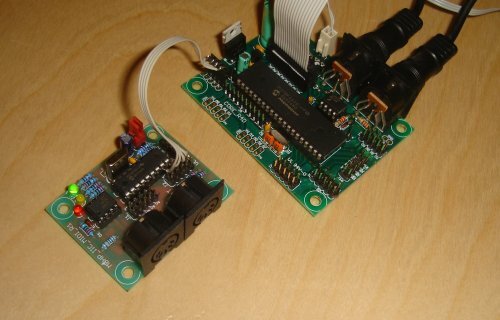 Combining these two interfaces opens the possibility to access multiple MIDI In and Out ports from a single microcontroller. In addition, the IIC MIDI "slaves" are doing some high level MIDI protocol handling in order to relieve the "master" core from time and memory intensive tasks. This improves the overall performance. as "workaround" for the annoying EUSART bug, which exists in PIC18F4620 A3 and A4 (64k flash device) and PIC18F4550 A3 (USB device), and which affects the reliability of the MIDI Out port. The MBHP_IIC_MIDI schematic contains a superset of all components which are supported by the firmware. There is also a reduced "OUT only" version available, which only contains the parts that are required for a single MIDI Out port - this version is especially interesting for people, who want to use the module as workaround for the EUSART bug. Note that this circuit could be downstripped even more by removing the Power and Tx LED, but in this case debugging could get difficult. Assumed, that this minimal circuit is built on a vector- or stripeboard, the costs for the PIC16F88, 20 MHz crystal, 4 caps, 4 resistors and 2 LEDs are just only ca. 5 EUR in total! Back to the complete version: the MBHP_IIC_MIDI address needs to be selected with jumpers at the J3 port. By default, both jumpers should be stuffed in order to select address 0x10. By removing jumpers, address 0x12, 0x14 or 0x16 can be selected. Each slave module needs an unique address at the IIC bus, therefore never use the same configuration for more than one module! Port J4 is a "MIDIbox Link" port, which provides MIDI IN/OUT at TTL level. It can be connected to a MBHP_LTC module in order to duplicate the MIDI OUT, and to get a MIDI THRU. J4 can also be used for a direct connection to another core module without using optocouplers. Port J1 is currently not used, it's free for customizations in the firmware. Last not least J2: this is the IIC port which is realized as a DIL header in order to simplify the 1:1 bus wiring between slaves and master. 4 of these pins (Vs/Vd for power, SC/SD for IIC) have to be connected to the pins with the same name at CORE::J4 and to IIC_MIDI::J2 of the other slaves. The RI# output is a special signal which identicates, that the receive buffer has been filled. It will only be used by a small number of applications and need to be connected to the core module, further details can be found at the appr. project pages. If no special hint is given, let this pin open. Never connect the RI# lines of the slaves together, because this will cause a short circuit! Imortant note for MBHP_CORE_V2 users: an additional 1k pull-up resistor is required between the Vd and SC line, it has to be directly soldered at CORE::J4 in order to allow "clock stretching". Thats a method to delay serial transfers when a slave cannot response immediately on a master request. The pull-up resistor for the SD line is already available at the core module (CORE::R2). MBHP_CORE_V3 users will notice, that both pull-up resistors are already available - no additional resistor needs to be added! Propably SmashTV and Mike will provide pre-programmed PIC16F88 in future, but so long this service is not available, you need to "burn" the firmware into the PIC16F88 by yourself (alternatively you could ask somebody in the forum) by using a PIC programmer like MBHP_BURNER. For 40 pin programmers an adapter to 18 pin is required, the schematic is located here. The programming voltage is 13.1V (PIC16F device! ), the programming software PBrenner has to be used. Details about the I2C protocol are described in the I2C bus specification of Philips. So long you are using MIOS functions to access the module, you don't need to take care about these bitstreams - just continue at the next chapter which describes the access algorithms. Slave address: the address could be confusing, therefore it will be mentioned first, that the MBHP_IIC_MIDI address is the IIC slave address leftshifted one (multiplied by two). Example: IIC address 0x08 is MBHP_IIC_MIDI address 0x10. This is to simplify the programming when appending the R/W# bit to the address. Thats also the reason, why MBHP_IIC_MIDI addresses are always even numbers. If 0x10 is sent after a Start condition, we are starting a write operation on the first MBHP_IIC_MIDI module, when 0x11 is sent, we are starting a read operation. The Tx buffer has a size of 96 bytes. Once the buffer is full, the slave will respond with a NAK (not acknoweledge, A bit=1). In this case, the master needs to send a Stop condition, thereafter it can retry. A Restart condition (start without Stop condition) is not allowed due to a silicon bug in the SSP module of most PIC16F derivatives. FF 00: enters and exits command mode, no further action. FF FF: enters command mode, sends 0xff over MIDI OUT, exits command mode. FF <cmd> <data1> ... <data_n>: enters command mode, branches to IIC_CMD_Handler in iic_cmd.asm on each byte being received. The maximum number of data bytes has to be determined within the handler, currently the handler just exits command mode after the first data byte. The command mode leads to following requirement: if 0xff ("MIDI Reset") should be forwarded to the MIDI OUT port, the master has to sent it twice via IIC. 0x02 2 two-byte system common messages like MTC, Song Select, etc. 0x03 3 three-byte system common messages like SPP, etc. // the address needs to be sent again! Note that the IIC_MIDI_Send() function can be "beautified" by using a separate function for sending the address - I've choosen the long version to simplify the reading. 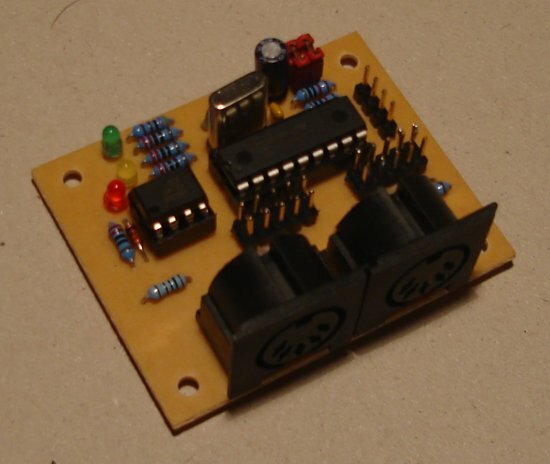 An assembly optimized version can be found in the MIDI Router project. Please note also, that this version doesn't take care about the special condition for sending a "0xff" byte over MIDI - the assembly optimized version will just be called recursively. This method would really "explode" the above example. 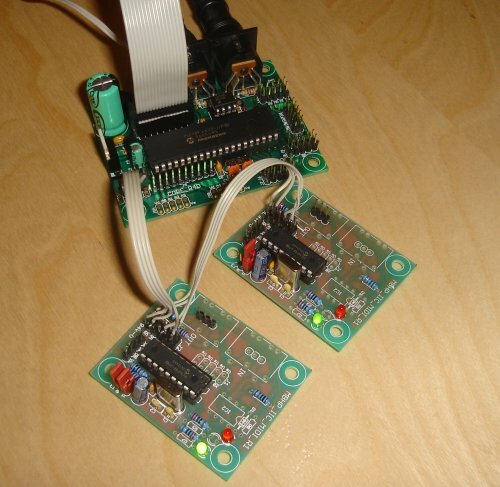 PCB data, can be viewed, modified and converted with Eagle Light. The .pdf based schematic has been created with xcircuit. There are no special eagle schematics available, since components have been netlisted in the .brd file directly! A software loopback application (iic_midi_sw_loopback) can be found in the MIOS Download section, which scans for available slaves, and directly forwards incoming MIDI data to the output ports of the same MBHP_IIC_MIDI slaves. This is a perfect application to test the module(s), and the included iic_midi.asm/iic_midi.h files can be used as module driver for selfwritten applications as well.